Respected Cheon Il Guk Supreme Council members! It is a privilege and a pleasure to be here with you today for the 6th Cheon Il Guk Supreme Council Meeting, centering on Heavenly Parent and True Parents. We have important work to do, and I appreciate all of you for your faithful attendance to True Mother at this time. We convene the 6th Cheon Il Guk Supreme Council meeting at a very historic time. The past several days have been filled with an inspiring array of programs honoring the 3rd Anniversary of True Father’s Ascension. These include the Sunhak Peace Prize, the UPF World Summit, Peace Road, the CIG World Leader’s Assembly, the Youth & Student World Assembly, and the publication of Chambumogyeong, centered on our beloved True Mother. It is clear that our movement is strong and moving forward under True Mother’s leadership. At the same time, the events of the past week have given me a renewed sense of purpose to make sure that we develop the Cheon Il Guk Constitution as a worthy roadmap for the future of our movement that Heavenly Parent, True Parents, and worldwide brothers and sisters can be deeply proud of. Each one of us in this room is here because True Parents have planted deep roots throughout the course of their lives, with unyielding passion, dedication, and a profound heart of love, compassion, and sacrifice for Heavenly Parent and humanity. The roots of the true olive tree are deep and secure, centered on True Parents’ words. We are all recipients of their grace through the Blessing, which connects us together as one family under God. As we know, once the root has been settled to provide nourishment, which is God’s love and True Parents’ Blessing, then the trunk can begin to form. The trunk needs to be a pillar that is connected to the root. 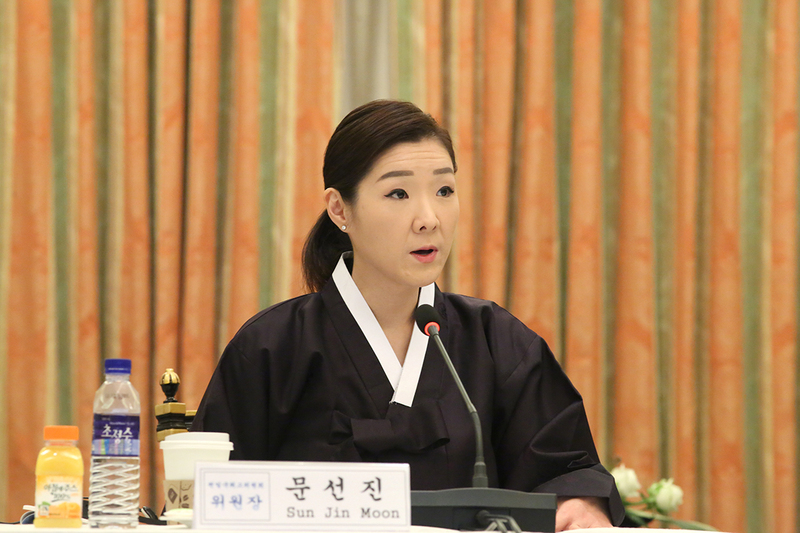 With this in mind, let us work to make sure the Cheon Il Guk Constitution will provide clarity, stability, and support, as a mainstay to connect our worldwide movement to our True Parents well into the future, beyond our own lifetimes. 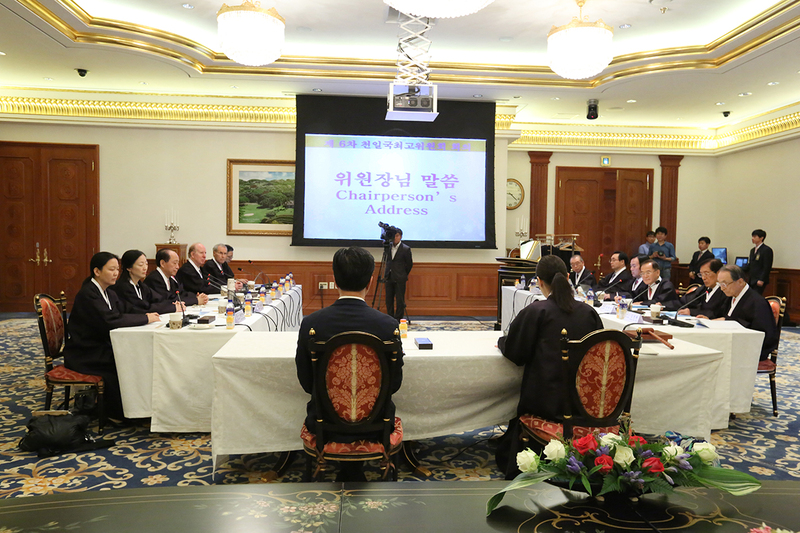 We have important work to do during this Supreme Council meeting, which is a continuation of the work initiated during the 4th and 5th Cheon Il Guk Supreme Council meetings. One important task is to continue to deliberate on both the proposed amendments to the Cheon Il Guk Constitution and the rules of procedure or by-laws of the 5 Wons. Throughout this process let us always keep in mind our True Mother’s guidance. Let us also be mindful of feedback we have received from our brothers and sisters from around the world. While the Cheon Il Guk Constitution has been affirmed, True Mother also asks that we continue to review and discuss this historical document. Moreover, as we identify areas of improvement that necessitate an amendment to the Constitution we should bring these to True Mother’s attention for her guidance. We are very fortunate that True Mother is with us during this time, so that any proposed amendments can receive her direct guidance. How will the CIG Constitution protect True Parents’ legacy? How will the CIG Constitution best serve our global community of brothers and sisters? What is the scope of the CIG Constitution in terms of its application? How can it become the pillar for True Parents’ words, Blessing, and tradition, and contribute to the stable growth and development of our movement? How can it be a source of unity? Since our last meeting, all of us at the CIG Secretariat along with the FFWPU IHQ staff and the staff of the 5 Wons or branches have worked diligently to analyze carefully to develop concrete proposals for revisions. I am very encouraged with the progress of the working sessions and proposals for revision. Rather than relying on our random ideas, we adhered to a very systematic and disciplined approach to proposing adjustments. Also, as I think we all recognize, the most important and recurring issue that emerged from going through each article of the constitution during our 4th and 5th CIGSC meetings had to do with succession, after True Mother is no longer with us. This 6th meeting of the CIG Supreme Council will be a very critical and important meeting since we will have the opportunity to deliberate and vote on both the proposed amendments to the Constitution and the management bylaws. Our recommendations will be presented to True Mother for her final approval. Given the importance and magnitude of this 6th Cheon Il Guk Supreme Council meeting, let us each use our acquired wisdom, experience, knowledge and heart to deliberate carefully and wisely. Also, please feel free to speak your opinion and vote according to your conscience. We are a team, and we can trust and respect one another, centered on True Love. But even greater than this, we are one family centered on Heavenly Parent and True Parents. Let us work together as filial sons and daughters to realize a harmonious, victorious nation of Cheon Il Guk. It is my fervent desire that we can help improve the Constitution, applying all our love, prayer, wisdom and hope, so that it can become a secure resource of harmony, peace, and love for generations to come. Even though we are very blessed to have True Mother with us on this earth, providing wise leadership, there is no time to spare. Therefore, we have an urgent responsibility. I know that if we can invest our hearts as a team and become one family under Heavenly Parent during this process of developing the CIG Constitution, future generations will look upon our efforts with gratitude. Once again, I want to thank you for your attendance to True Mother and for your service as members of the CIG Supreme Council. Let us use these precious two days together to give our very best effort for the sake of our Heavenly Parent, our True Parents, all Blessed Central Families and the 7 billion people of the world.